UK, 1949, 92 minutes, Black and white. Stewart Granger, Jean Simmons, Helen Cherry, Edwin Styles, Beatrice Varley, Wilfrid Hyde White. 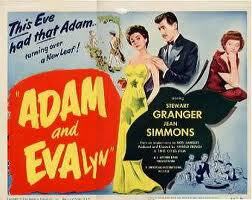 Adam and Evelyne was a pleasant star vehicle for Stewart Granger, so popular in British films in the late '40s, and Jean Simmons who was emerging as a star and was to marry Granger. They were to appear in a number of films including Young Bess, Footsteps in the Fog. The screenplay is based loosely on the classic story of Daddy Longlegs. Jean Simmons is the young orphan who imagines her father to be different from what he is. She then inherits a stepfather and falls in love with him. There is a good supporting cast led by Helen Cherry. A piece of entertaining British fluff. 1. Entertaining? Pleasant romance? The Daddy Longlegs theme? 2. British filmmaking in the '40s: black and white photography, London, gambling and racing? Style? Cast? 3. Jean Simmons' charm as Evelyne? At the orphanage, her hard life, romantic dreams, image of her father, letters, the arrival of Adam? Leaving the orphanage and its routine? The apartment? The sightseeing trip, the buying spree? Adam as ideal? Moira and her awareness of the truth? Evelyne going to Switzerland for the finishing school, growing up? Back in society? Roddy and his infatuation with her? Her plain speaking? Attitudes towards marriage, gambling, telling the truth? Her discovery of the truth? Her future? 4. Adam as the suave gambler, his private gambling rooms, the clientele, Bill and the friendship during the war? Chris and the horses, the fall, the inheritance? His visit to the orphanage? Bringing Evelyne home? Not telling her the truth? The liaison with Moira? Enjoying Evelyne's company? Her return, his not realising his falling in love with her? The change in his style, the moustache? His devices to cover up the gambling? His nights out with the young people? His brother Roddy being a cad, the clashes with him? The police, his being exposed, paying the fine? Telling the truth ? and the happy ending? 5. Chris and his love for his daughter, the letters and building up Adam, the race, falling and dying? 6. Bill as Adam's valet, friendly, covering for him? 7. Moira as the suave divorcee, setting her sights on Adam, the gambling rooms, their clientele, her knowing the truth about Evelyne's emotions clashing, the fight with Adam, her spite? 8. Roddy as cad, his attempted seduction of Evelyne? 9. The gambling world, the wealthy gamblers, Wilfrid Hyde White and his comic style, jewellery to cover debts? Private, high stakes, the raid? The cover and people-playing the piano etc. for a soiree? 10. A picture of post-war England, people settling back after the experience of the war, crime and reform?